Facebook’s worst-kept secret is finally ready for its closeup: the company is starting to roll out Facebook Questions, a Q&A service that allows users to poll all of Facebook. Facebook has been inviting users to apply to join a sneak peek of Questions for months now, so we’ve seen much of this before, but this marks the first time that it will begin rolling out to users who didn’t apply for the beta program. Facebook says that this is intiitally rolling out to 3-5 million users, with plans for a broader rollout down the line. The motivations behind the launch are clear: millions of people already use Facebook status updates to poll their friends — it’s only natural that the site would offer a dedicated mechanism to do this (and it’s also likely to be a boon for page views, especially once Questions are syndicated to search engines). But if you were hoping the new product would incorporate Facebook’s extensive privacy settings, you’ll be disappointed: everything in Questions is shared with everyone else on Facebook, and every question you ask is tied to your real name; likewise, anyone who answers will have their response tied to their account. Of course, having all questions set to public does have one nice side effect: you’ll be able to poll from Facebook’s massive audience of 500 million users. Facebook obviously isn’t going to ask your question to everyone else on Facebook; instead, its system is going to try to analyze a user’s interests to determine who would be best able to answer your question. The service will also show the question to some of your friends, so ideally you’ll receive answers from a healthy mix of friends and experts (we’ll see how well it actually works). You’ll be able to ask a question from a few places: the Questions tab that appears in the site’s left navigation area, the publisher that appears at the top of the page (where you typically post things like status updates), and, most interestingly, the search box. 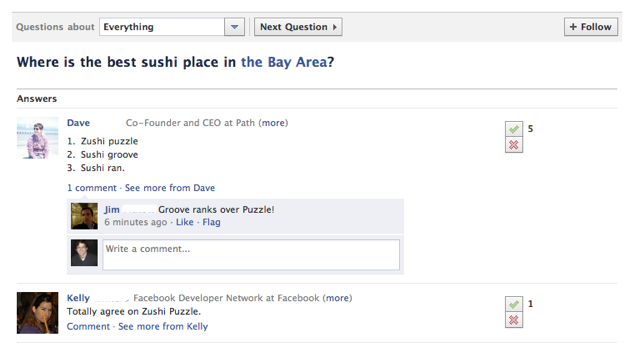 When you start typing a question into Facebook’s search box, the site will start displaying a list of similar questions that have already been asked on the site. If yours doesn’t pop up, or you really want to re-ask the same thing, you can ask it directly from the search field. Questions can include photos and polls, and you can also tag questions with topics. If you come across someone else’s question that you’d also like to know the answer to, you can opt to follow it. And the site also supports keyboard shortcuts, which should make the soon-to-be Questions addicts happy. This could be a big, big deal for the site. Given its size, it won’t take long for Facebook to build up a massive amount of data — if that data is consistently reliable, Questions could turn into a viable alternative to Google for many queries. Facebook will also be integrating Questions and their answers into the Community Pages that launched in April, which already include content from Wikipedia and Facebook user status updates. Finally, this is a big SEO opportunity for the site, though a Facebook spokeswoman said that there are no plans to include the content in search engines yet. Of course, some of this success will lie in how well Facebook’s matching algorithms work, and how good typical answers are — I’m not going to use this at all if the quality is on par with Yahoo Answers. Facebook will be competing on this front with Quora, a Q&A service that was cofounded by Facebook’s former longtime CTO, and has been widely praised for the quality of its content (though whether or not it can maintain that quality as the site scales remains to be seen). Still, even if the quality isn’t quite up to par, the massive built-in userbase means Facebook Questions will be a success regardless. One other thing to note: Facebook does not offer any way to ask a question anonymously (remember, everything is tied to your name). While I see the benefit in forcing responses to include a user name (you can better tell if the person answering knows what they’re talking about), I’m less sure that this is a good policy to enforce on the people asking the question. There may well be times when you may have a question that might appear a bit less than professional (“Best place to get my friend hammered for his bachelor’s party?”), or perhaps a little embarrassing to admit to your peers (“Why does my microwave popcorn always start smoking?”).